Need a 10-minute dinner idea that you can serve either cold or hot? 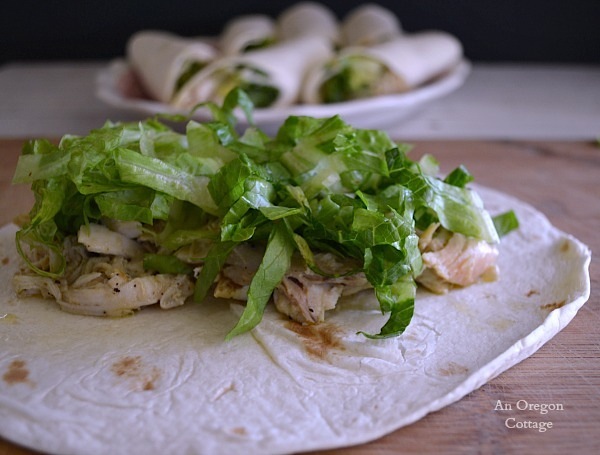 You (and your family) will love these chicken caesar wraps made with pre-cooked chicken! Our family absolutely loves Caesar anything (this slaw is fabulous, and we eat this classic dressing often), so I was pretty sure that combining chicken, lettuce, parmesan and Caesar dressing was going to go over well around here. Yeah, they’re already asking me when we can have these again. Even better than that, this meal comes together quickly whether I use my Spiced Whole Slow Cooked Chicken or a rotisserie chicken from Costco (seriously yummy and inexpensive) and they can be served with warmed chicken or cold depending on the weather and what your family feels like. 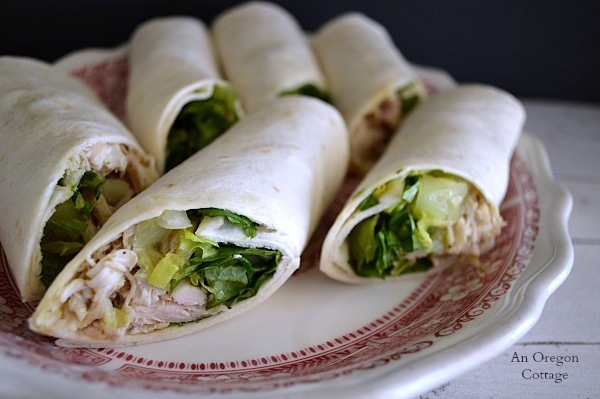 Mixed with homemade Classic Caesar Salad Dressing and topped with shredded romaine lettuce, these wraps are a one-dish meal, though for dinner I sometimes serve them with chips and salsa and maybe some fruit or carrot sticks as well. So quick, easy, delicious and versatile? I know these will be in regular rotation on our menus for sure! TIP: if you make a Slow Cooker Rotisserie-Style Whole Chicken, you probably won’t use all of it unless your family is large so you can use the remaining chicken to make things like Mexican Chicken Corn Soup or Chicken-Pesto Greek Style Pizza. Or any of these 18 (and counting!) 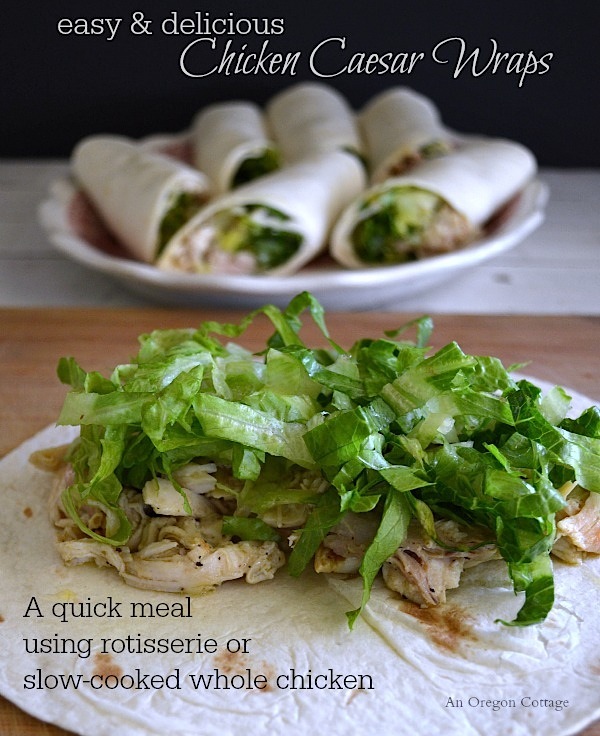 recipes that use cooked chicken! My family would love that. We all love Caesar Salad. We had wraps tonight, too! It’s one of my favorite, what-the-heck-am-I-gonna-make-for-dinner, meals. You can go to any country, with any protein, drizzle on some sauce, and it’s delicious. It was Thai-themed tonight. Ground pork with lots of ginger and garlic, soy sauce, lime juice, and honey. Lettuce, red bell pepper, cucumber, radish, and cilantro for filling in. (Clean out the crisper drawer) Lots of sriracha up on top for heat. Good stuff, Maynard! As frustrating as it is sometimes at the end of the meal plan, when the fridge is empty, some of the best meals are born that way. Totally agree, Mindy! 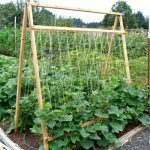 Wraps, roasting, or chopped salads are my go-to ways to use up bit’s and pieces of veggies – and you’re so right, many times they’re our favorite dishes!